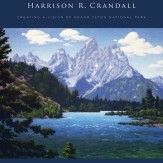 Join us Sep 6-8 as author Kenneth Barrick visits Cayuse to autograph copies of his new book Harrison R. Crandall – Creating a Vision of Grand Teton National Park. Crandall was Grand Teton Park’s first and only official photographer and Jackson Hole’s first resident artist. This new 240 page book, by Kenneth A. Barrick is filled not only with photos and artwork he is known for, but it also has personal photographs and stories of family and the development of Grand Teton National Park. Crandall’s daughter and son in law, Quita and Herb Pownall, contributed immensely to the book, preserving this early 20th century artist’s story. Time: Ken Signs Books 10am to 5pm; Reception 5pm to 8pm with fiddles, food and fun!